I have been a fan of multiple monitor set-ups for a long time, and I have run two of them for the past several years. It has been three years since my review of the Matrox DualHead2Go version of this product. Since that time, I have continued to run this system without incident. So without reservation, I can say that it is reliable. Why, you might reasonably ask, would you want more than one big monitor? For me personally, when I'm writing and editing it's really helpful when working with drafts. Draft number one contains lots of good stuff that should make it into the final copy. I can move parts of draft one on monitor number one onto monitor two, and keep the first draft intact. I can also have a graphic program open on the second monitor so I can see the images going into my work. When I'm not writing, I can use one monitor for my work and use the other for email and Yahoo's instant messenger - easily seen, but out of the way. I can also watch two Web pages at the same time or run two programs, each on its own monitor. It really beats hitting Alt, Tab to switch windows. Also, if you so desire, you can span one program across all the monitors. The TripleHead2Go is one of several products that Matrox calls GXMs - Graphics eXpansion Modules. It is a small box that sits between your computer and your monitors. The TripleHead2Go has four ports: one for your computer and one each for the left, right and middle monitors. This review deals with the analog model, which supports three monitors at 1280 X 1024 resolution each. Other models accommodate other port configurations; the digital and DisplayPort models support three monitors at 1680 X 1050. Here is a view of the TripleHead2Go connections. Pretty simple: input, right, left, center and power. Connecting the TripleHead2Go is "hammer" simple - no tools or electronic knowledge are required. After you install the software on the CD, you will see an icon on the taskbar that looks like this, to the right. When you click it, you have access to the configuration dialogs for monitor resolution and image quality. Now that you have it running, your office is transformed from average to extraordinary. You will have to become accustomed to finding the cursor over a lot of screen real estate. Three 19-inch monitors are, all together, 57 inches wide, or almost 5 feet! Here's an example of how I recently used my three-monitor set-up in a local emergency communication exercise for the command center of the local Canine Search and Rescue Teams. This involved several pieces of software and ham radio. The representation below shows the set-up used. The left monitor shows the search and rescue teams tracked by their radio call signs and their tactical call signs. The center monitor shows the tracks of the teams on a local topographical map. Their positions are posted from an automated radio/GPS signal by the program DMMapper (right monitor) to a topo map in Terrain Navigator by Maptech. The third monitor shows an image of the search area taken from Bing.com. You could do all this with just one monitor, but you would be incessantly Alt-Tabbing to switch from one to another. If you are the command and control operator running this exercise, your configuration choice is obvious. In the past, multiple monitors were the province of Emergency Operations Centers,Â intelligence agencies, traffic controllers or those dealing with lots of imagery. With the TripleHead2Go, you can be in the "big leagues," too. 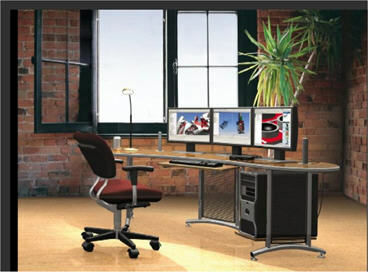 Once you use a multi-monitor set-up, the applications are endless and it is difficult to go back to just one monitor. Three monitors for gaming (for your kids, of course) is very cool. You can see a video of games running across three monitors. Oh, your existing (ho-hum) one monitor is shown at the top of most of the demos for comparison. The TripleHead2Go is a simple and easy way to get beyond seeing only one or just a few things at a time on your computer screen. It resides totally outside your computer and will work with your laptop, tower or both, and your next computer, as well.Â This device can let you create your own command and control center, right on your own computer. Be part of the panorama and move beyond the Cyclops view. The Triplehead2Go (Analog) has a suggested retail price of $299.00. The digital and DisplayPort versions have a suggested retail price of $329.00. Ed. note: Matrox donated the TripleHead2Go that was used in this review to the Piedmont Amateur Radio Emergency Service Club, Putnam County. GA.